How do the upgrade plans add up? Just last week, we fired up the Cray supercomputers and crunched the numbers of T-Mobile’s new upgrade program called JUMP! Since then, AT&T made its announcement about a similar equipment upgrade plan called AT&T Next. Shortly thereafter, we learned about Verizon working on yet another upgrade program called Verizon Edge. We should provide you with a caveat, there is some disagreement even amongst us, your humble writers, as to the role that equipment subsidies play in the business model and rate plans, so we have gone to great lengths to compare a number of scenarios. The issue of subsidies and their role in rate plans will be discussed in the conclusion of this article. For these comparisons, we contrast the upgrade plans as they have been presented by the carriers. Then, we will even the markers up and look at costs if you upgrade equipment at the same interval. We also examine how things line up when you add carrier service plans to the picture. As usual, we are not incorporating taxes because they vary by location. Unlike the variety in our initial numbers crunch with T-Mobile’s JUMP!, we are only going to address the “preferred” pricing model (that is, what is on their web-site, sans contingencies for bad credit) from T-Mobile. We will also compare costs of two models, the Samsung Galaxy S4 and Apple iPhone with 64GB of storage, two flagship devices with distinctly different price points, plus we picked a lower-priced smart device that might retail in the $400 range (like a Nexus 4). Since lower end devices are not as pervasive across all carriers, the examples will not be a price-point match, but will be relevant to those that are thinking about those devices. We are also going to look at what it costs if you cancel service with these plans versus being on a regular two-year contract (if applicable). It should make for a very interesting comparison. Let's turn the page and see what happens. Next page: How do the upgrade plans add up? Wendytroll, this is very temporary and only on one carrier. So if you "believe" in the $20/month subsidy built into the contract on ATT and Verizon, then both their plans are a complete ripoff compared to T-Mobile and EVEN THEIR OWN 2 year contract plans.!. I don't understand why you illustrate this in only one table in the whole article. ATT and Verizon are a joke. Sorry, I guess it is illustrated in the first two tables on page 4. Still confusing. That number gets thrown around everywhere with no validation. It was likely drawn from the time when T-Mobile offered two tiers of plans, one to accommodate subsidized equipment, the other if you bought at full retail. However, a flat rate makes no sense in the other carrier's models (especially AT&T's whose plans are arguably built on a previous generation model). Subsidies, like other customer facing price points, are a moving target. They change like the weather and that is where the argument about subsidies lose some ground. what is that stupid SMH ??? So it's okay to be confused after reading this article, right? Because I am definitely confused. That is exactly what the carriers want:). Basically, an argument can be made for T-mobile deal if you need to upgrade phones. But IMHO, the ATT and Verizon deals are a ripoff. You would be better off signing two-year contract's and selling phone on craigslist if you need to upgrade. That is the best way to go across the board, buy a phone or two at/near retail and fund your own upgrades through selling your old gear. The second hand market for smartphones is very active. Agree, but the problem with that on ATT and Verizon (once again if you believe in the $20/month subsidy) is you are paying that subsidy, even though you paid full price for the phone. So they are charging you for a phone you have already paid for. Coming from someone who sells ATT, VZW and T-Mobile at my job, and thus have a pretty comprehensive knowledge of all the plans, ATT Next and VZW Edge seem like a rip off. 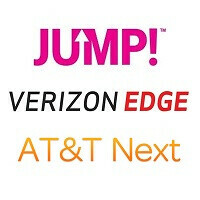 T-Mobile Jump is reasonable, but you can still get subsidized phones on two year contracts through them at third party retailers (check out my long ish post further down) and they have a pretty low ETF which makes the value plans in general not great if you want to get a phone through them anyway. As much as my employers would hate for me to say this, the best deal is always going to be a Nexus 4 unlocked and putting it on T-Mobile's insane $30 prepaid plan. But if you don't like paying $300 up front, there are some decent options on two year contracts still. Long story short, I wouldn't consider any of these early upgrade plans, they seem awful compared to the previous two structures of subsidies and unlocked/prepaid. What $30 prepaid plan? Link please. Seriously, I am not being snarky. I went to T-Mo and couldn't find a $30 prepaid plan. The best I found was a $50/month prepaid plan, but it was limited to like 250 Mb/month data on 4G/LTE. Yeah, that's what I'm referring to. You only get 5GB of 4g speeds and 100 minutes of talk. But you can just VoIP and 5GB is plenty for someone like me. If I wasn't on a Verizon dealer plan it would be that one for me. The subsidy as it gets thrown around is a misnomer and not accurate. You are trolling and doing so incoherently. I'm going to be tweaking some things to give the article some more breathing room. Hopefully that will help. Lmao! I hope so, cause I'm confused as hell! But the way I see it, since I've already opted for equipment coverage on my Note2, I may as well go to a Jump! Plan. It gives me the equipment protection I'm already paying for and the opportunity to upgrade early. Kinda looks like a win-win, but I'm not sure. If I choose to skip my upgrade and keep the phone the full 2 years, is it mine? Or do I still have to turn it in when I upgrade? If I pay the $20 for the whole 20 months, I assume it's mine! If I understand it correctly, you have the option (whenever you want to upgrade) of either paying off the phone or turning it in. Could be wrong, but that makes sense to me. I hope you're right. That just makes sense. Thanks! Link? I saw AT&T offering a $60/month prepaid with unlimited talk and text and 3 Gb/month data. Is there a better option?